Fine Violins, Violas, Cellos & Bows | Guitars & Woodwinds | Skinner Auction | Skinner Inc.
BOSTON, MA – November 4, 2013 – Skinner, Inc., the only auction house hosting in-person sales of exceptional, high-quality instruments, announces its fall auction of Fine Musical Instruments on November 24, highlighted by the offering of a fine Pressenda violin. More than 300 lots will be featured, including stringed instruments from famed makers such as Gagliano, Rocca, Bisiach, Gadda, and Lucci, as well as a selection of fine bows. The auction also presents an exemplary Benedetto Guitar, a collection of flutes, and an 1803 Erard harp sold by the Museum of Fine Arts, Boston to benefit the collection. The auction’s top lot is anextremely rare and wonderfully preserved Joannes Franciscus Pressenda violin,c.1822 (Lot 30, estimated between $170,000 and $190,000). Pressenda, arguably one of the most important Italian violin maker of the 19th century, modeled his instruments closely on Stradivari, but introduced personal touches, such as his own interpretation of the corners, edges, f-holes, and scroll. The instrument has a beautiful, even sound and its layers of varnish range from a golden yellow to a rich, fiery red-brown. Another highlight is an exceptional Italian violoncello from 1860 by Pressenda’s student, Joseph Rocca, (Lot No. 36, $140,000 to $160,000). A fine example of Rocca’s work, the instrument has a rich, transparent ruby red-brown varnish. It also possesses a remarkably clear and penetrating tone quality, giving it desirable qualities as a solo instrument. 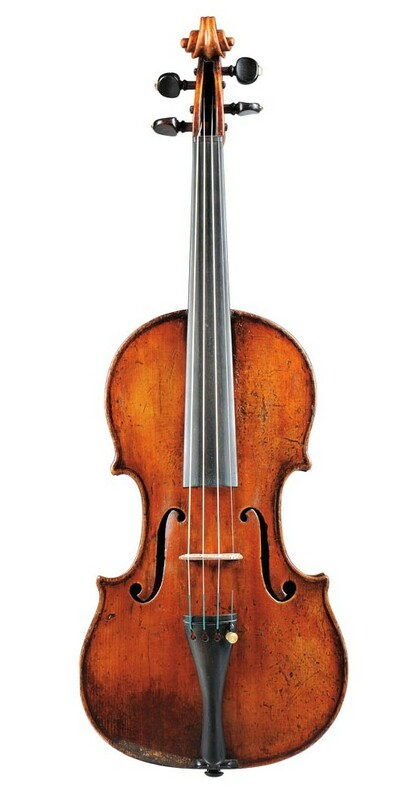 Skinner is also pleased to offer a fine Italian violin by Nicolaus Gagliano, 1720 (Lot 33, $120,000 to $140,000). The Gagliano family, synonymous with violin-making and their native Naples, began crafting violins as far back as 1640, continuing to the early 20th century. Horst Kloss describes the instrument offered on November 24 as a “player’s dream: elegant, light and perfectly balanced.” The Gagliano comes from the estate of Ruth Curwen, an avid amateur violinist who was given the instrument by her teacher, and had long associations with organizations such as Greenwood Music Camp, the Boston Philharmonic Orchestra, the Concord (MA) Orchestra, and many others. Proceeds from the sale of this instrument will go to benefit a Boston-area string training program. Among the 20th century bowed instruments to be auctioned is a Modern Italian Violin by Romeo Antoniazzi, Cremona, 1922, (Lot 25, $30,000 to $40,000), as well as a Modern Italian Viola by Genuzio Carletti, c. 1952 (Lot 37, $4,000 to $6,000). Skinner is pleased to offer a very large selection of bows, as well, including a Silver-mounted Violin Bow stamped J. Tubbs , (Lot 43, $7,500 to $9,000), and a Silver-mounted Lamy Cello Bow, (Lot 55, $5,000 to $7,000). The November 24 auction will feature 30 lots of flutes, among them a beautiful Gold Flute by Brannen-Cooper of Boston (Lot 169, $8,000 to $10,000). The flutes are part of a collection that belonged to the late Barbara Trauffer (1934-2011), who played flute and piccolo with the Alabama Symphony Orchestra from 1965 to 1993 and was a member of the faculty of the Alabama School for Fine Arts for thirteen years. An exceptional 1961 French Tenor Saxophone (Lot 141, $7,000 to $9,000) by Henri Selmer, will also be offered, an extremely desirable instrument in pristine condition. Previews for the auction will be held on Friday, November 22 from noon to 7 PM, Saturday, November 23 from 10:30 AM to 5 PM, and Sunday, November 24, from 9 AM to 10 AM. Illustrated Catalog #2688B is available from the Subscription Department, at 508-970-3240, or from the Gallery. Prices realized will be available online at www.skinnerinc.com, both during and after the sale. The Skinner website enables users to view every lot in the auctions, leave bids, order catalogs and bid live, in real-time, through SkinnerLive! The Skinner Fine Musical Instruments department deals in fine and high-quality bowed and fretted stringed instruments, primarily through public auction and also through private sale. Skinner auctions of Fine Musical Instruments, held twice annually in the spring and fall, routinely realize highly competitive prices. The department sold a fine and important Stradivarius violin, circa 1721, for $1.4 million, and a 1958 Gibson Explorer Electric Guitar for $611,000 – a world record at auction. Skinner has recently added a timed, online-only sale of instruments for students, restoration, and the trade. For questions, contact the department at 508-970-3135 or music@skinnerinc.com. This entry was posted in News and tagged auction, Bisiach, boston, cello, cello bow, Gadda, Gagliano, gold flute, guitar, harp, Horst Kloss, Italian violin, Jill Arbetter, Lucci, music, Musical Instruments, Pressenda, rare guitar, Rocca, stringed instruments, viola, violin, violin bow by Skinner. Bookmark the permalink.